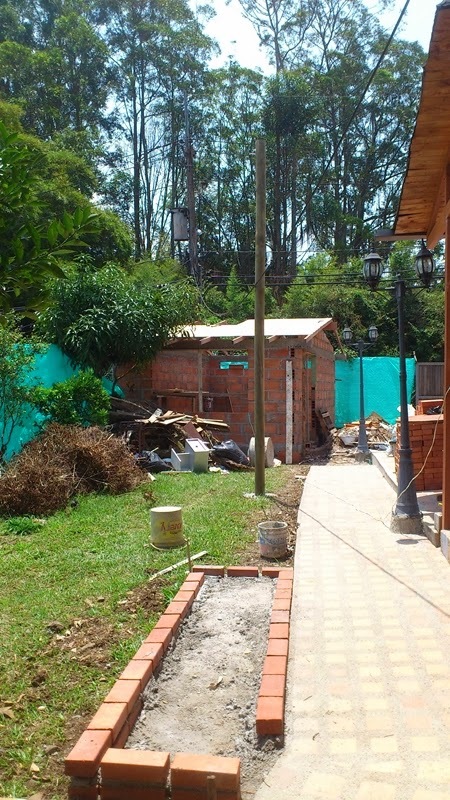 An Englishman in Colombia: I'm not much use on site at the moment! I'm not much use on site at the moment! I had a rough night, with all the milk and water I had drunk, I might as well have camped in the bathroom, however I had a thought to sooth my throat and went down for a spoonful of honey, and it worked. This morning, other than feeling tired, I felt much better, and set off with some of Marcela's gear in the trailer, stopping to buy some cement on the way. I spent the morning doing some woodwork, but to be honest, my heart wasn't in it, it was boiling hot, and as the morning wore on, I felt ill again, so returned home. Apparently the thinners affected my respiratory defences, and it looks as if I I now have a genuine case of flu. Ramillo is getting on with putting the roof on the workshop, despite the heat. John meanwhile has set the footings for the BBQ, although he has done none of the finishing jobs, we asked him to complete before the week-end. On my return home, we went up to the local Restaurant for lunch, and met John as we left, supposedly he had been to give a quote nearby, so Marcela took the opportunity to tell him to stop work on the workshop tomorrow, and finish the jobs in the house. We then had to go to Homecenter to buy more bits for the kitchen gas circuit, unfortunately I didn't have any washing up liquid when I tested the circuit, so I used the tried and tested Spanish method, of using a cigarette lighter, and it worked, I had some excellent flames, not on my solder joint, but on a compression joint, so I have had to redesign! We took the opportunity to go for a Frozzy (frozen yoghurt) it certainly soothed the throat. Then it was on, to have the oil changed in the Hyundai, it was only 300km past it's limit, but I rather keep it up to date.